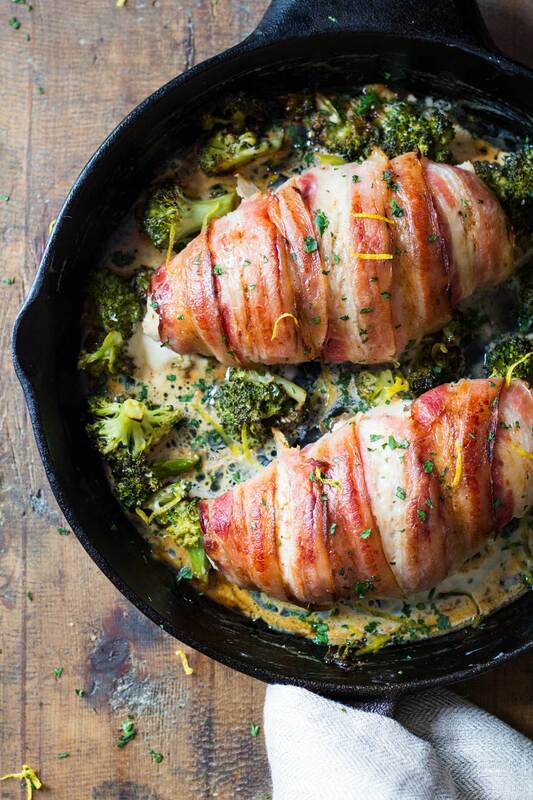 Wrap bacon strips around chicken breasts and add to a cast iron skillet or other oven proof dish (ceramic or oven-proof glass dish). But broccoli florets around chicken breasts making sure every floret touches the ground. Put in the oven for 30-ish minutes (4.5min/oz). Turn on broiler and broil until bacon is crispy and golden (3-5 minutes). Carefully take out of the oven (skillet will be hot hot hot hot) and let rest for 8-10 minutes before serving and cutting into the breast. Add creme fraiche and juice of half a lemon to juices in the skillet and use a small spoon or spatula to mix in well. Sprinkle with freshly chopped parsley and lemon zest if desired. In a large skillet, over medium-high heat, heat 1 Tablespoon olive oil. Add chicken, garlic, lemon-pepper, oregano and salt. Cook and stir until chicken is no longer pink and is fully cooked. Warm pitas or flatbreads in microwave for a few seconds. Then divide the warm chicken between the pita or flatbreads. Top each with diced tomato, cucumber, onion and Feta cheese. Drizzle tops with Tzatziki sauce. Enjoy! Preheat oven to 400 degrees F and line a baking sheet with parchment paper (or lightly grease with non-stick spray). In the meantime wrap tofu in a clean, absorbent towel and set something heavy on top (such as a cast iron skillet) to press out the liquid. Once the oven is preheated, dice tofu into 1/4-inch cubes and arrange on baking sheet. Bake for 26-30 minutes. You’re looking for golden brown edges and a texture that’s firm to the touch. The longer it bakes, the firmer and crispier it will become, so if you’re looking for softer tofu remove from the oven around the 26-28 minute mark. I prefer crispy tofu, so I bake mine the full 30 minutes. Set aside. While the tofu bakes prepare your rice by bringing 12 cups of water to a boil in a large pot. Once boiling, add rinsed rice and stir. Boil on high uncovered for 30 minutes, then strain for 10 seconds and return to pot removed from the heat. Cover with a lid and let steam for 10 minutes*. 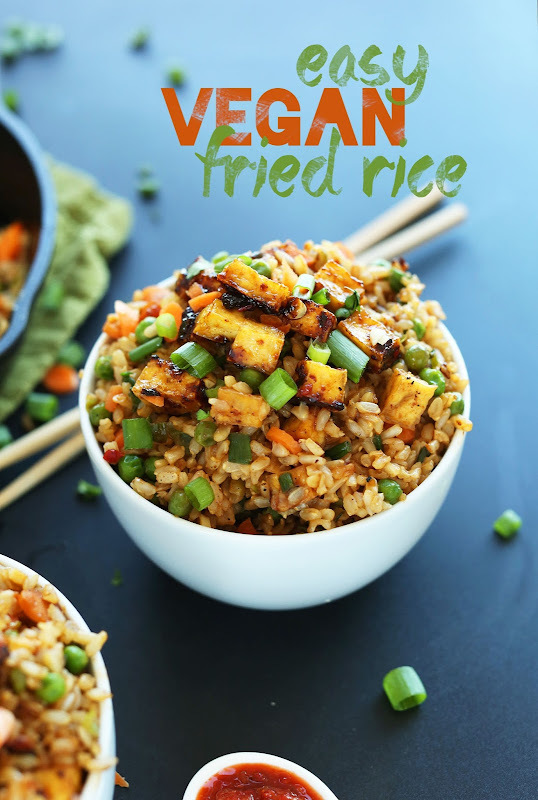 While rice and tofu are cooking, prepare sauce by adding all ingredients to a medium-size mixing bowl and whisking to combine. Taste and adjust flavor as needed, adding more tamari or soy for saltiness, peanut butter for creaminess, brown sugar for sweetness, or chili garlic sauce for heat. Once the tofu is done baking, add directly to the sauce and marinate for 5 minutes, stirring occasionally. Heat a large metal or cast iron skillet over medium heat. Once hot, use a slotted spoon to scoop the tofu into the pan leaving most of the sauce behind. Cook for 3-4 minutes, stirring occasionally, until deep golden brown on all sides (see photo). Lower heat if browning too quickly. Remove from pan and set aside. To the still hot pan add garlic, green onion, peas and carrots. Sauté for 3-4 minutes, stirring occasionally, and season with 1 Tbsp (15 ml) tamari or soy sauce. Add cooked rice, tofu, and remaining sauce and stir. Cook over medium-high heat for 3-4 minutes, stirring frequently. Serve immediately with extra chili garlic sauce or sriracha for heat (optional). Crushed salted, roasted peanuts or cashews make a lovely additional garnish. Leftovers keep well in the refrigerator for 3-4 days, though best when fresh. Reheat in a skillet over medium heat, or in the microwave. Begin by heating a large skillet to medium high heat. Coat with cooking oil. Mix together the chicken breast chunks and cornstarch (or arrowroot) so the chicken pieces are completely coated. Toss in the skillet. Cook for about 5 minutes until chicken is browned, but not cooked through. Make the sauce. In a small bowl, mix together soy sauce, hoisin, vinegar, sriracha, oil, chicken broth, sugar, and garlic cloves. Place chicken in the slow cooker, top with sauce. Set your slow cooker to low and cook for 4 hours. 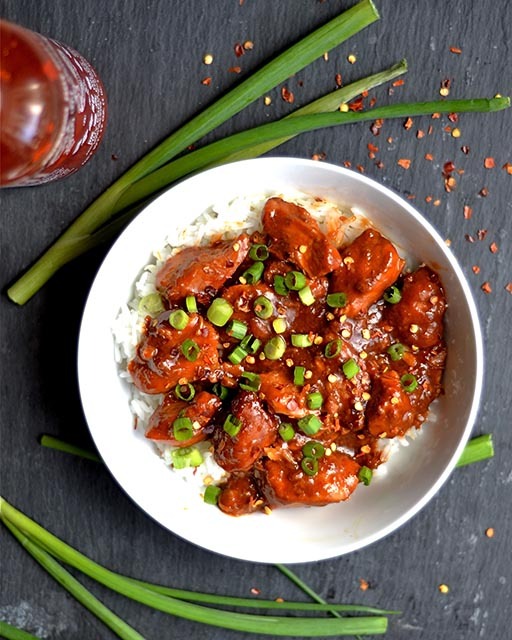 Top with crushed red pepper (if using) and serve over rice with green onion. Peel and slice the ginger, and crush the cloves of garlic. Slice the mushrooms into thin strips. Remove the skin from the chicken pieces. Place the uncooked rice in the bottom of the Instant Pot and add the crushed garlic, sliced ginger, and sliced mushrooms on top. Lay the chicken pieces over the rice and aromatics. Finally, add seven cups of water. Close and lock the lid of the Instant Pot. Turn the steam release valve to the "sealing" position. Press the "porridge" button to begin cooking (no need to adjust the time or pressure). After ten seconds the pot will begin to heat and build pressure. Once it reaches the required temperature and pressure, the display will begin to count down 20 minutes. After 20 minutes, the pot will switch to the "keep warm" setting and begin to drop in pressure. Allow the pot to reduce in pressure naturally, without opening the steam release valve. When the float valve falls back to the down position, open the steam valve, and then open the lid. Using tongs, carefully remove the chicken pieces and place them on a clean cutting board. Use two forks to shred the meat and remove the bones. Return the shredded meat to the pot. Stir and taste the porridge, and add salt as needed (I added ½ Tbsp). Only add enough salt to amplify the flavors, but leave room for the addition of soy sauce as a topping. 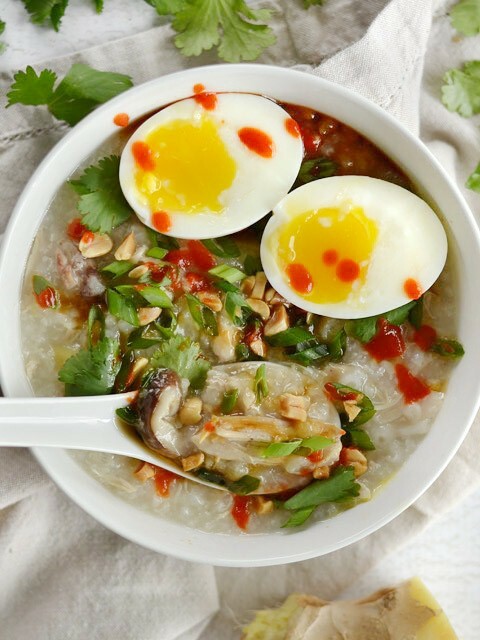 Ladle the congee into each bowl and drizzle a small amount (1 tsp) of toasted sesame oil and soy sauce on top of each bowl. Sprinkle the sliced green onions, cilantro leaves, and chopped peanuts over top, then serve. Heat olive oil in a large pot over medium-high heat. Crumble sausage into pot and brown, stirring and breaking up sausage occasionally, until cooked through. Drain sausage onto a plate lined with several layers of paper towels while reserving 1 Tbsp rendered fat in pot (if there's not a tbsp just add 1 more tbsp olive oil to pot). Add onions and carrots and saute 3 minutes then add garlic and saute 1 minute longer. Stir in beef broth, tomatoes, tomato sauce, Italian seasoning and season with salt and pepper to taste. Bring to a light boil, return sausage to pot, cover pot and reduce heat to medium-low and allow to simmer until carrots are nearly tender, about 15 minutes. Stir in tortellini and kale then cover and cook 7 - 9 minutes longer. 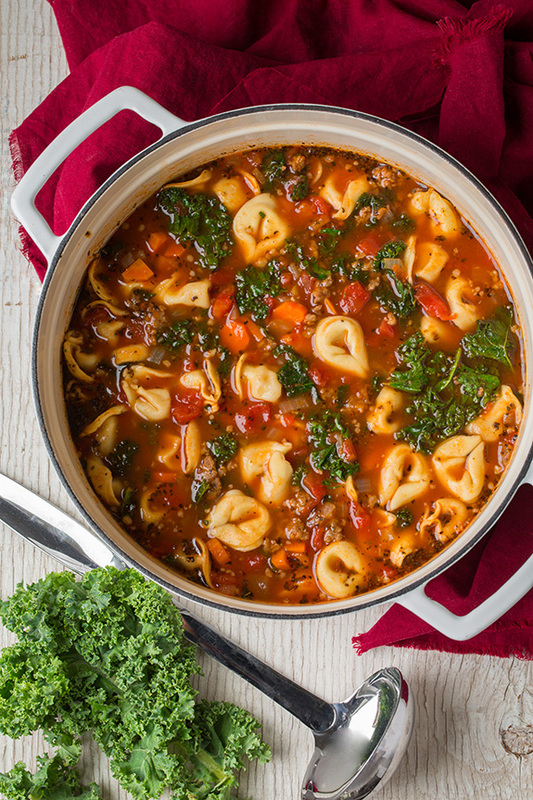 Serve warm with parmesan cheese if desired (note that as the soup rests the tortellini will absorb more broth so you can add more broth or water to thin as desired).